Rhode Island is home to 12 different snake species -- a diverse grouping for a northern state with seasonally cold temperatures. Even those unfamiliar with snakes can learn to identify most of the native species, though the identification of a few requires careful observation. While some of the native species have mild venom used to subdue prey, and even non-venomous snakes have sharp teeth and can bite, no snake in Rhode Island represents a serious threat to humans. Smooth green snakes are small, insectivorous serpents that live in bushes, high grass and shrubs. You can identify them at a glance -- smooth green snakes (Liochlorophis vernalis) are the only green species native to the state. Worm snakes (Carphophis amoenus amoenus) are almost as easy to identify. Usually found under rocks, logs or leaf litter, worm snakes are 7 to 12 inches in length, brown above, light pink below and shiny. Just as their name implies -- they feed on, and look like, worms. 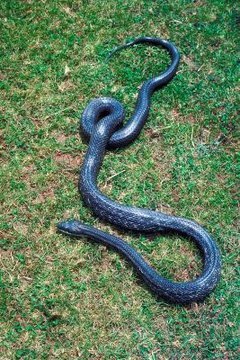 Rhode Island is home to two primarily black species: black racers (Coluber constrictor constrictor) and black rat snakes (Pantherophis alleghaniensis). Behavior can provide the easiest identification -- black racers are prowlers, often seen in open habitats, while black rat snakes are excellent climbers, frequently seen near forest edges. Both species are blotched as juveniles; while black rat snakes may retain the hint of pattern into adulthood or have scattered light scales, black racers are uniform black by the time they are mature. Racers reach about 5 feet in length, while rat snakes occasionally reach 7 feet in length. Both species have white ventral surfaces. Eastern ribbon snakes (Thamnophis sauritus sauritus) and eastern garter snakes (Thamnophis sirtalis sirtalis) are similar-looking and closely-related animals that can be tricky for laypersons to distinguish from each other. These 2- to 4-foot-long snakes are the only species in the state with bold, lengthwise stripes down the length of their bodies, and both prefer living in close proximity to water. Eastern garter snakes are quite variable, but generally have a single yellow stripe down their backs, while eastern ribbon snakes have three stripes on their backs. Northern water snakes (Nerodia sipedon sipedon) are 3- to 4-foot long snakes that usually exhibit both blotches and bands on their bodies. Northern water snakes usually display red to brown bands near the head, which become red or brown blotches towards the tail. Water snakes spend most of their time near permanent water, but may travel over land from time to time. Eastern milksnakes (Lampropeltis triangulum triangulum) feature reddish-brown blotches on top of a light gray ground color. These rodent- and lizard-eating constrictors average about 3 feet in length, but can grow much larger. Some snakes exhibit variable patterns and markings; even siblings from the same clutch or litter may not resemble each other. Brown snakes (Storeria dekayi dekayi) are highly variable; different individuals display ground colors that range from gray to brown, on top of which they display different amounts of cross-hatching and other markings. To identify them, look for the light verterbral stripe with dark spots along its border. Eastern hognose snakes (Heterodon platirhinos) vary greatly, but all are easily identified by their upturned nose. If these snakes become frightened, they exhibit stereotyped defensive displays, in which they hiss, flatten their necks, coil their tails and sometimes roll over and play dead. Two Rhode Island species have brightly colored bellies -- northern ringneck snakes (Diadophis punctatus edwardsii) and northern redbelly snakes (Storeria occipitomaculata occipitomaculata). Ringneck snakes generally have a yellow ventral surface and a bold yellow neck ring that completely encircles the neck. Red belly snakes have the characteristic red belly, but rather than a complete ring surrounding their neck, they have three light spots. Both of these small snakes -- generally less than 2 feet in length -- use mild venom to help overpower their invertebrate prey, but are harmless to humans.